We have some young Artists who drew for us their favourite Mysteries of the Rosary. In doing so, they also showed a very good knowledge of the details of those Mysteries. who have shown their love for her and Jesus in this wonderful way. 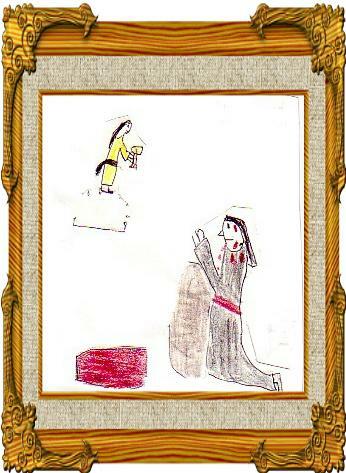 The First Sorrowful Mystery, the Agony in the Garden, by Jacob, aged 8 yrs. Christ kneels at the Rock in the Garden of Gethsemani, and an angel comes to comfort him. Christ prays, "Father, if it is possible, let this chalice pass from me. But not as I will, but as Thou willest.". His agony became so intense that great drops of bloody sweat were forced from Him, and flowed to the earth. 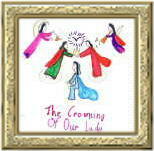 The Fifth Glorious Mystery, the Crowning of Our Lady, by Elyse, aged 9 yrs. Following the "dormition" (falling asleep) of Our Lady, she was conducted to Heaven by Her Son Jesus. The Blessed Trinity, Father, Son and Holy Spirit all combined to crown her as the Glorious Queen of Heaven, with a crown, the likes of which has not been seen either before or after. 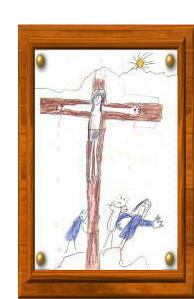 The Fifth Sorrowful Mystery Crucifixion, by Nicholas aged 7 yrs. Shows the terrible agony which Our Lord suffered, for three hours hanging on the Cross, in reparation for our sins. And He proved His love for us so perfectly in doing so. Knowing this, how could we ever offend Him again? The Third Joyful Mystery, Birth of Our Lord by Celeste, aged 6yrs. The miraculous event of Christ's birth, which had been foretold for generations, and expected in the world, had finally arrived. His birth was in very humble surroundings, which is reflected and emphasised in the simplicity of this drawing. And here are our artists - Left to right Celeste,Nicholas, Elyse and Jacob.